Despite the obsessive preoccupation with Israeli building activities in the West Bank and East Jerusalem, the greatest obstacle to peace between the Israelis and the Palestinians is almost never mentioned in media accounts: virulent, jihadist hatred of Jews. Contrary to what many assume, however, jihadism in its current form is not a throwback to some medieval mindset but a confluence of traditional Islamic teachings and the anti-Semitism and extermination goals of Nazism. Without understanding how the latter has influenced the former, it would be difficult to identify how modern jihadists find a basis for some of their pronouncements. For example, a faithful Muslim could arguably support a Jewish presence in historic Palestine since the Qur'an designates the Land of Israel as a dwelling place for the Jews, to which they will be returned as the last days approach. Clearly this viewpoint runs counter to the jihadists' agenda as well as their rhetoric. But it is through their rhetoric that the deadly adaptation of Nazi views surrounding an Islamic core is seen most clearly. 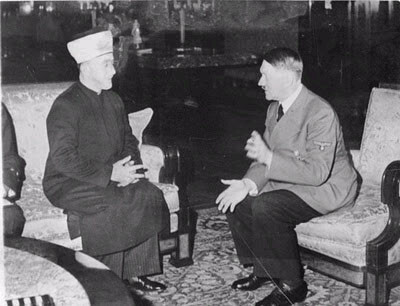 The Jerusalem mufti Hajj Amin Husseini (left, with Adolf Hitler, Berlin, November 28, 1941), leader of the Palestinian Arabs from the early 1920s to the 1940s, was a rabid Jew-hater who mixed Islam's millennial disparagement of Jews with modern themes of European anti-Semitism (notably The Protocols of the Elders of Zion) in indoctrinating his subjects. Muslim Brotherhood founder Hassan al-Banna (1906-49) said he learned a great deal from the Nazis about the effectiveness of propaganda in spreading hatred of Jews. Hitler himself makes two basic points in this connection: (1) "something of the most insolent lie will always remain and stick," and (2) the aim of propaganda is not to inform but to incite "wrathful hatred." Hence, like the Nazis, modern jihadists, who derive much of their inspiration from the writings of Banna and others of the Brotherhood, often invoke such discredited works as The Protocols of the Elders of Zion, an anti-Semitic tract fabricated by the Russian secret police at the turn of the twentieth century, as evidence of a world Zionist conspiracy. They have resurrected the medieval blood libel and have accused the Jews of every evil, from spreading cancer to dispensing aphrodisiacs to Muslim women. When jihadists are not busy denying the Holocaust, they take their cue from Hitler and blame the Jews for the outbreak of World War II and its bloody consequences. Thus, for example, Palestinian Authority (PA) president Mahmoud Abbas argued in his book, The Other Side: The Secret Relationship between Nazism and the Zionist Movement, that less than a million Jews had been killed in the Holocaust and that the Zionist movement was a partner in the mass slaughter of the Jews. Alfred Rosenberg, perhaps the Nazis' most influential ideologue after Hitler, argued that Jews must be annihilated because the Aryan race had been "poisoned by Judaism" and not merely by Jewish blood: The essence of Jewish evil, he maintained, found its expression in Judaism, and both the "ism" and the essence were in the blood. All Jews, thus, were essentially evil and must, therefore, be eliminated. Such notions are echoed by Sayyid Qutb, the most influential of the modern jihadist ideologues after Banna, who held that "Jews were by nature determined to fight God's truth and sow corruption and confusion," and that "the deeper cause of the Jewish hatred of Islam was the malevolent Jewish nature." If the Jews left Palestine to us, would we start loving them? Of course not. … They are enemies not because they occupied Palestine. They would have been enemies even if they did not occupy a thing. … Our fighting with the Jews is eternal, and it will not end until the final battle … until not a single Jew remains on the face of the earth. The jihadist invocation of God to justify the murder of Jews echoes the inscription on the belt buckles of the Nazi SS: Gott Mit Uns—"God [is] with us." Hatred of the Jew is a holy hatred, pleasing to God and incumbent upon the pious Muslim or the loyal Nazi. Both groups portray their struggle as adhering to God's will but in effect take on the role of substituting for God. It is no coincidence that the charter of Hamas, the Palestinian branch of the Muslim Brotherhood, is called the "Charter of Allah": Hamas is Allah. Like the Nazis, the Islamist jihadists have formulated an ideology of absolutes rooted in a will to power that deems anything outside Dar al-Islam, the "realm of Islam," to be either illegitimate or evil. Absolutes allow no room for negotiation with "evil." For a jihadist to acknowledge the political legitimacy of the Jewish state would be to acknowledge the existential legitimacy of evil. Both the Nazi and jihadist forms of hatred of Jews are driven by a will to extermination. Thus Bernard Lewis writes that the era of murderous anti-Semitism that "began with the rise of Hitler did not end with his fall." More than any other, the jihadist who embraced the Nazis' loathing of Jews and their extermination goals was Hajj Amin al-Husseini, leader of the Palestinian Arabs from the 1920s to the late 1940s. Husseini's entry into the politics of jihadism came in the wake of the signing of the Weizmann-Faisal agreement in January 1919, articles III and IV of which assured the Jews a homeland in Palestine. After inciting riots in Jerusalem in 1920 with cries of "Kill the Jews. There is no punishment for killing Jews," Husseini fled the country and was sentenced in absentia to ten years in prison. When elections to select a new mufti were held in April 1921, the British High Commissioner for Palestine, Sir Herbert Samuel, bypassed the official process and appointed Husseini to the position in an effort to secure the domestic peace. This had the opposite effect: One of Husseini's first acts as mufti was to declare a jihad against the British and the Jews. In August 1929, in a response to the mufti's cry that "he who kills a Jew is assured a place in the next world," Arabs went on a rampage throughout Palestine, leaving 133 Jews dead and 339 wounded. On April 19, 1936, again at Husseini's incitement, rioting against the Jews erupted in Jaffa in what subsequently evolved into a three-year Arab revolt but not before the mufti had begun building his alliances with the Nazis. Eichmann wrote glowingly of "the national and racial conscience" that he observed while amongst the Arabs. He reported that "Nazi flags fly in Palestine, and they adorn their houses with swastikas and portraits of Hitler." The meeting took place during the Arab "revolt," just months after the Peel Commission's report of July 7, 1937, which recommended a two-state solution to the tensions between Palestinian Jews and Arabs. That was not the solution that Husseini wanted, and Eichmann knew it. Days later, on October 13, the mufti again fled Palestine for Lebanon to avoid arrest and possible deportation for inciting violence against the British Mandate government. Two years later, he set up his base of operations in Baghdad and joined with Rashid Ali al-Gaylani to lead a Nazi-backed takeover of the Iraqi government on April 1, 1941. By May 31, the British had successfully suppressed the coup but not before Husseini had issued a fatwa (religious edict) announcing a jihad against Britain and the Jews. Months later, on November 28, 1941, the mufti, whom the Nazis now deemed the "champion of Arab liberation," sat opposite Adolf Hitler, who assured him that the Nazis and the Arabs were engaged in the same struggle, namely, the extermination of the Jews. By the end of the year, Husseini had met again with Eichmann, by now tasked with executing the "Final Solution"; his deputy Dieter Wisliceny later testified that Eichmann had informed the mufti "of the plan concerning the 'Final Solution of the Jewish Question in Europe.'" Eichmann's deputy also claimed that "the mufti was one of the initiators of the systematic extermination of European Jewry and had been a collaborator and advisor of Eichmann and Himmler in the execution of this plan." Authors David Dalin and John Rothman have argued along these lines that "of the major Nazi leaders, Heinrich Himmler was the one with whom al-Husseini collaborated most actively and consistently … One of the common goals shared by al-Husseini and Himmler, who was the architect of the Nazis' 'Final Solution,' was the extermination of the Jews." Indeed, in his memoirs, the mufti had no qualms about boasting of his intimate friendship with Himmler. Husseini had at his disposal six radio stations from which he issued regular Arabic language broadcasts urging Muslims in service to God to kill Jews everywhere. On December 11, 1942, he called Muslims to "martyrdom" as Germany's allies against the English and the Jews. "The spilled blood of martyrs," he cried, "is the water of life." A week later, at a meeting of the Islamische Zentral-Institut, he recited verses from the Qur'an teaching that the Jews were the "most implacable enemies of the Muslims." On November 2, 1943, he declared at a rally in the Luftwaffe Hall in Berlin, "The Germans know how to get rid of the Jews … They have definitely solved the Jewish problem. [This makes] our friendship with Germany not a provisional one, dependent on conditions, but a permanent and lasting friendship." The mufti's actions were as murderous as his words. As early as January 1942, Husseini had begun recruiting Muslims to serve in German SS killing units, the most infamous of which was the Mountain Handschar Division of 21,065 men. Other Muslim SS killing units included the Skanderberg Division in Albania and the Arabisches Freiheitskorps in Macedonia. These murderous Muslim units played a major role in rendering the Balkans Judenrein (free of Jews) during the winter of 1943-44. As these units were doing their work, the mufti was taking other measures to hasten the slaughter of the Jews. According to Wisliceny and Hungarian Jewish leader Rudolf Kastner, Husseini wrote letters to the governments of Bulgaria (May 6, 1943), Italy (June 10, 1943), Romania and Hungary (June 28, 1943) demanding that their Jews be exterminated without delay. In a broadcast aired on January 21, 1944, Husseini continued to blend Nazism with jihadism, asserting that "the Koran says, 'You will find that the Jews are the worst enemies of the Moslems.' There are also considerable similarities between Islamic principles and those of National Socialism." In fact, he enumerated seven points that Nazis and Muslims had in common: "(1) monotheism—unity of leadership, the leadership principle; (2) a sense of obedience and discipline; (3) the battle and the honor of dying in battle; (4) community, following the principle: the collective above the individual; (5) high esteem for motherhood and prohibition of abortion; (6) glorification of work and creativity: 'Islam protects and values productive work, of whatever kind it may be'; (7) attitude toward the Jews—'in the struggle against Jewry, Islam and National Socialism are very close.'" Two months later, Husseini enjoined his followers to "kill the Jews wherever you find them. This pleases God, history, and religion." If "Islamic jihad blends religion and nationalism in its endeavor to annihilate Israel," as Ziad Abu-Amr says, this statement not only echoes his incitement of the Arabs' anti-Jewish riots of 1920 and 1929 but also exemplifies Husseini's jihadist stance. As the fighting that year dragged on, Husseini grew afraid that the war might end before the prime directive of the extermination of the Jews could be achieved. Twice he wrote to Himmler, urging him to use every means possible to complete the extermination of the Jews. When the war ended, Husseini became a Nazi war criminal. Nonetheless, he received a hero's welcome when he turned up in Egypt on June 20, 1946, thanks to the assistance of the French authorities. Ten days later, the Muslim Brotherhood newspaper al-Ikhwan al-Muslimin announced, "The Arab hero and symbol of al-jihad and patience and struggle is here in Egypt." This paragon of jihadism soon met with Banna and Qutb to continue "the same struggle that Hitler and Germany—and Husseini himself—had been waging during the war," according to American academic Jeffrey Herf. With the Nazis' extermination goals in mind, he also took under his wing a promising young man: Yasser Arafat. In his Nazi mufti mentor, the future Nobel Peace Prize laureate discovered a true soul mate. Arafat expressed his admiration for the mufti until the end of his days, describing him in an interview published in the Palestinian newspaper al-Quds as his "model and hero." This mentor enlisted him in the Muslim Brotherhood where he received his first military training at the hands of former Nazis. In October 1959, Arafat and some of his colleagues founded Fatah, a word that means "conquest" and is a reverse acronym for Harakat at-Tahrir al-Filastini (The movement for the liberation of Palestine). Fatah's ultimate aim, as stated in its platform, is "the annihilation of the Zionist entity in all of its economic, political, military, and cultural manifestations." In late May 1964, a gathering of 422 Palestinian activists in East Jerusalem established the Palestine Liberation Organization (PLO) and approved its two foundation documents—the organization's Basic Constitution and the Palestinian National Covenant. By the end of the decade, the PLO had been overtaken by Fatah with Arafat appointed as chairman. Anyone who wants to know what stands in the way of peace between the Israelis and the Palestinians need only read the Palestinian National Charter, which assumed its final form in July 1968. Reminiscent of the Nazis' focus on blood purity, article 4 sets a similar tone, stating that "Palestinian identity is a genuine, essential, and inherent characteristic; it is transmitted from parents to children." The covenant allows no room either for negotiations or for a peaceful means of attaining their ends (articles 9, 10, and 21). Just as the Jews threatened the existence and the essence of the Aryan nation, so they threaten the existence and the essence of the Arab nation because "the destiny of the Arab nation and, indeed, Arab existence itself depends upon the destiny of the Palestine cause" (article 14); the elimination of the Jews is not merely a political issue but, most fundamentally, an existential, ontological issue. Anything that might legitimize Jewish existence, then, must be debunked, which is the point of article 20: "Claims of historical or religious ties of Jews with Palestine are incompatible with the facts of history." The Jews simply have no place in Palestine, which must be made Judenrein. Furthermore, the implication of article 22 is that there is no place for the Jew anywhere: "Israel is the instrument of the Zionist movement and geographical base for world imperialism … Israel is a constant source of threat vis-à-vis peace in the Middle East and the whole world." Just as the Nazis would deliver humanity from the Jewish evil, so the PLO would save humankind; and just as the Nazis were willing to give the appearance of negotiations in the run up to World War II, winning Czechoslovakia without a single shot through the notorious Munich agreement, so the PLO adopted in July 1974 the "phased strategy," stipulating that the Palestinians should seize whatever territory Israel is prepared or compelled to cede to them and use it as a springboard for further territorial gains until achieving the "complete liberation of Palestine." Even as Arafat shook Yitzhak Rabin's hand on the White House lawn on September 13, 1993, he informed the Palestinians in a prerecorded, Arabic-language message broadcast by Jordanian television, that the Israeli-Palestinian declaration of principles, also known as the Oslo accords, was merely the implementation of the PLO's "phased strategy." Despite Arafat's declaration after the September 1972 massacre of eleven Israeli athletes at the Munich Olympic games that every Jew was a target and his subsequent proclamation that the "end of Israel is the goal of our struggle, and it allows neither compromise nor mediation … Peace for us means the destruction of Israel and nothing else," the United Nations welcomed the PLO as the representative of the Palestinians and granted it observer status. Small wonder that following that recognition, PLO chief Salah Khalaf had no qualms about asserting that an "independent state on the West Bank and Gaza is the beginning of the final solution," intentionally echoing the Nazi code word for the extermination of European Jewry that informed the PLO's own outlook. In February 1979, just days after the Iranian Islamic revolution, Arafat was welcomed in Tehran where he declared to the founding father of the Islamic Republic, Ayatollah Ruhollah Khomeini, "The path we have chosen is identical." This embrace of the Iranian revolution, as well as Arafat's roots in the Muslim Brotherhood to which others of Fatah's founding fathers belonged, indicates that the PLO was not as secular as many claimed. In 1987, Arafat affirmed that "the religious trend is an integral part of the PLO," and Khalaf averred, "The beginning of the Islamic awakening lay in sanctified jihad, which was started by Fatah." Just a year prior to signing the Oslo accords, Arafat vilified the Jews—not the Israelis—using strongly religious imagery: "Damn their [the Jews'] fathers. The dogs. Filth and dirt … Treachery flows in their blood, as the Qur'an testifies." In order to inculcate such a view in Palestinian children, Arafat saw to it that the agreement would allow the Palestinians to retain control over the curricula in their schools. Historian Efraim Karsh argues that "Arafat's indoctrination of hatred among Palestinian children was unparalleled since Nazi Germany." In the years attending the Oslo accords, Arafat repeatedly compared his strategy to the one used by the Prophet Muhammad, who signed the Treaty of Hudaibiya with the people of Mecca in 628, only to break it when the situation shifted to his advantage. The confluence between Nazi aims and jihadist thought continued unabated. Shortly after gaining control of the Gaza Strip and Jericho in accordance with the declaration of principles, Fatah leader Sakhr Habash stated that once the Palestinians had control of Gaza and the West Bank, they would proceed to the "final solution." In October 1994, Arafat appointed Ikrima Sabri as mufti of Jerusalem; Sabri preached a rabid hatred of the Jews, using Qur'anic phrasing to denounce them as "descendants of pigs and apes," accusing them of involvement in a "world Zionist conspiracy," and blaming them in another confluence with Nazi imagery for every ill that had befallen humanity. On January 30, 1996, Arafat showed his hand and his indebtedness to Nazi thought when he told a group of Arab diplomats in Stockholm, "We plan to eliminate the State of Israel and establish a purely Palestinian state." Another Fatah-appointed religious leader, Ahmad Abu Halabiya declared in an October 2000 Friday sermon, "Have no mercy on the Jews, no matter where they are, in any country," making abundantly clear that for Fatah, like the Nazis and Husseini before them, the evil to be overcome was not a Jewish state but the presence of Jews in the world. Arafat's death in November 2004 by no means changed Fatah's views on the extermination of the Jews. On August 4, 2009, after a lapse of twenty years, Fatah's Sixth General Assembly convened in Bethlehem where it reaffirmed the hatred of Jews that had fuelled its drive for the destruction of the Jewish state. The assembly called for a continued "armed struggle" against the Jews—as "a strategy, not tactic"—adding that the "struggle will not stop until the Zionist entity is eliminated and Palestine is liberated." By this time, however, Fatah was in the midst of a power struggle with the Islamist group Hamas—not over the ultimate goal but over who would control its attainment. That power struggle continues to unfold. It is in the words of Hamas activists and leaders, and especially the organization's 1988 charter, that the link between Nazi ideology and triumphalist jihadism in the Palestinian "resistance" movements can be seen most clearly. As indicated in article 2 of its charter, Hamas is an offshoot of the Muslim Brotherhood; its chief founder, Ahmad Yassin, grew up in awe of Nazi ally Hajj Amin Husseini. Yassin's views on eliminating the Jews can be seen clearly in a 2000 Palestinian television broadcast where he proclaimed that Jews "must be butchered and killed, as Allah the Almighty said: 'Fight them: Allah will torture them at your hands, and will humiliate them and will help you to overcome them.'" Hamas makes "no distinctions between Jews, Zionists, and Israelis," which means their war is not about ending the Jewish "occupation" of Palestine but rather ridding the planet of Jews. As British academic Beverley Milton-Edwards noted, "The Hamas view of the Jewish people is not drawn solely from the pages of the Qur'an and Hadith [sayings and actions by Muhammad]. Its myopia is also the product of Western anti-Semitic [primarily Nazi] influences." As a modern Islamist, jihadist movement, Hamas is defined by a distinctively modern mutation of Islamic hatred of Jews as exemplified in the writings of the Muslim Brotherhood's most influential jihadist ideologue, Sayyid Qutb. Qutb was known for quoting Islamic sources in his diatribes against the Jews to show that they are rejected by God and that on judgment day they shall "taste suffering through fire." In his infamous essay "Our Struggle with the Jews," he quotes passages from the Qur'an, including, "You will surely find the worst enemies of the Muslim to be the Jews and the polytheists" (5:82), to show that "the Jews have confronted Islam with enmity from the moment that the Islamic state was established in Medina." He continues with: "Everywhere the Jews have been they have committed unprecedented abominations." Qutb's invocation of scripture and his use of a revisionist history are in keeping with a modern current in anti-Semitism, particularly when combined with his claim that the aim of world Jewry is to "penetrate into the body politic of the whole world and then … be free to perpetuate their evil designs." This fear of a world Jewish conspiracy is distinctively modern, and the Muslim Brotherhood has bought into it. The preamble of Hamas's charter quotes Muslim Brotherhood founder Hassan al-Banna's statement that "Israel will exist and will continue to exist until Islam will obliterate it." When Banna made his assertion, the Jewish state did not yet exist, so the reference to Israel is a reference to the Jewish people. Hamas understands itself to be functioning not merely as a political or religious movement but as the incarnation of God's governance of the universe. Article 1 in its charter states that Hamas is "based on the common coordinated and interdependent conceptions of the laws of the universe." Accordingly, Hamas's deeds and aspirations are a reflection of God's laws of the universe. The organization extends its reach into a realm beyond that of the Nazis: Whereas the Nazis insisted on the purity of blood, the jihadists insist on the purity of their very being since what is at stake is the ultimate annihilation of the Jewish presence in the world. As Banna put it, in its pure form, Islam regulates all of being—"the affairs of men in this world and the next"—so that "the mission of the Muslim Brotherhood is pure and unsullied, unblemished by any stain." Relying upon a famous hadith, article 7 of the charter states, "The Prophet, Allah bless him and grant him salvation, has said: 'The Day of Judgment will not come about until Muslims fight the Jews [killing the Jews], when the Jew will hide behind stones and trees. The stones and trees will say, 'O Muslims, O Abdulla, there is a Jew behind me, come and kill him.'" Nature itself rebels against the existence of the Jews: Natural law, therefore, requires the eradication of the Jews. Thus there can be no compromise, no peace with the Jewish state which, by definition, is an evil and unnatural entity. initiatives, and so-called peaceful solutions and international conferences, are in contradiction to the principles of the Islamic Resistance Movement. Abusing any part of Palestine is abuse directed against part of religion. Nationalism of the Islamic Resistance Movement is part of its religion…. There is no solution for the Palestinian question except through jihad. Article 15 states that "it is necessary that scientists, educators and teachers, information and media people, as well as the educated masses, especially the youth and sheikhs of the Islamic movements, should take part in the operation of awakening [the masses]." Thus it ends with the refrain from the famous collection of hadith by the renowned, ninth-century Muslim scholar al-Bukhari: "I will assault and kill, assault and kill, assault and kill [the Jews]." Hamas also echoes Hitler's assertion that "only the greatness of the sacrifices will win new fighters for the cause" when it proclaims that a good Muslim mother must indoctrinate her children for "religious duties in preparation for the role of fighting awaiting them." Such a call to arms has, in recent years, transformed murder into martyrdom: The jihadist's ticket to paradise must be purchased not with his own blood but with Jewish blood. Hamas's view of the Jew as a pervasive, all-powerful presence that threatens humanity echoes Hitler's insistence that the Jew is an "invisible wire puller" who by stealth conspires to rule the world. It also underlies their view of the Jew as a threat not only to the Arabs of Palestine but to all of humanity, as stated in article 22: Jews "were behind the French Revolution, the communist revolution, and most of the revolutions … They formed secret societies … They were able to control imperialistic countries and instigate them to colonize many countries … There is no war going on anywhere without having their finger in it." The Jew is behind every war—a belief shared by Hamas and Hitler. Therefore, the Jews are the source of every evil, a point reiterated in article 28: "The Zionist invasion [of the world] is a vicious invasion. It does not refrain from resorting to all methods, using all evil… They aim at undermining societies, destroying values, corrupting consciences, deteriorating character, and annihilating Islam … Israel, Judaism, and Jews challenge Islam and the Muslim people." Article 32 takes the theme a step further: "When they will have digested the region they overtook, they will aspire to further expansion, and so on. Their plan is embodied in the Protocols of the Elders of Zion … Leaving the circle of struggle with Zionism is high treason, and cursed be he who does that." The invocation of the Protocols as a proof text is, of course, a method also employed by the Nazis bringing to mind Banna's assertion that he had learned much from the Nazis about the use of propaganda. In Hamas's worldview, evil is rooted not only in the Jews but in Judaism itself. Unlike the rest of humanity, the Jew can be neither redeemed nor rehabilitated, any more than one could make Satan into a saint. The only way to liberate humanity is to cast the satanic Jew into hell, and, as the embodiment of God on earth, Hamas takes the lead in that endeavor: Hamas is humanity's savior. To abandon its mission would be to renounce its followers' place in paradise. Politicians who are entrusted with securing the peace in the Middle East fail to see reality. Inasmuch as negotiators will not name the evil they confront, they remain blind to it. Enjoying the complicity of the media, leaders in the Obama administration and elsewhere refuse to refer to Islamist fascists as either Islamists or as fascists. Such a position reflects an inexcusable, willful ignorance of the history, religion, culture, and languages that go into the making of modern jihadism. What must be understood above all is this: Hamas and Fatah have developed a theological and ideological justification that precludes any negotiations that would lead to a lasting peace with a Jewish state. At best, one can expect an application of the PLO's phased strategy, which gives the illusion of peace without renouncing its goal of Jewish extermination. Neither Hamas nor Fatah can agree in good faith to any peace with the Jews since in their eyes to do so would amount to treason or apostasy or both. What then is to be done beyond naming the evil? Simply stated, Islamist jihadism must be eliminated, and given their ideological stances, neither Hamas nor Fatah can be a viable partner in peace; therefore, their removal from power is a prerequisite to any future for Israelis and Palestinians alike. Whether the present revolutionary turmoil sweeping the Arab world will produce such a result remains to be seen. David Patterson is Hillel Feinberg Chair in Holocaust studies at the University of Texas at Dallas. This article is based on research done for his book A Genealogy of Evil: Anti-Semitism from Nazism to Islamic Jihad (Cambridge University Press, 2011). Hassan al-Banna, Five Tracts of Hassan al-Banna: A Selection from the Majmuat Rasail al-Imam al-Shahid Hassan al-Banna, trans. Charles Wendell (Berkeley: University of California Press, 1978), pp. 45-6. Adolf Hitler, Mein Kampf, trans. Ralph Manheim (Boston: Houghton Mifflin, 1971), p. 232. See Bernard Lewis, Semites and Anti-Semites: An Inquiry into Conflict and Prejudice (New York: W. W. Norton, 1999), pp. 265-6. Adolf Hitler, speech before the Reichstag, Jan. 30, 1939, Speeches and Proclamations, vol. 3, trans. Chris Wilcox (Würzburg: Domarus Verlag, 1996), pp. 1443-54. Mahmoud Abbas, Al-Wajh al-Akhar: al-Alaqat as-Sirriya bayna an-Naziya wa-l-Sihyuniya (Amman: Dar Ibn Rushd, 1984), quoted in Holocaust Denial in the Middle East: The Latest Anti-Israel Propaganda Theme (New York: Anti-Defamation League, 2001), pp. 5-6. Alfred Rosenberg, Race and Race History and Other Essays, ed. Robert Pais (New York: Harper and Row, 1974), pp. 131-2. Quoted in Ronald L. Nettler, Past Trials and Present Tribulations: A Muslim Fundamentalist's View of the Jews (Oxford, Eng. : Pergamon, 1987), p. 35. Matthias Küntzel, Jihad and Jew-Hatred: Islamism, Nazism, and the Roots of 9/11, trans. Colin Meade (New York: Telos Press, 2007), p. 149. Muhammad Hussein Yaqoub, "We Will Fight, Defeat, and Annihilate Them," al-Rahma TV, Jan. 17, 2009, Middle East Media Research Institute, Washington, D.C., Special Dispatch No. 2278, Mar. 12, 2009. "Hamas Covenant 1988," Yale Law School Avalon Project, accessed Mar. 14, 2011; "The Charter of Allah: The Platform of the Islamic Resistance Movement (Hamas), 1988," Palestine Center, accessed Mar. 14, 2011. Lewis, Semites and Anti-Semites, p. 13. Weizmann-Faisal agreement, Jan. 1919, Jewish Virtual Library, accessed Mar. 14, 2011. David G. Dalin and John F. Rothman, Icon of Evil: Hitler's Mufti and the Rise of Radical Islam (New York: Random House, 2008), p. 13. Küntzel, Jihad and Jew-Hatred, p. 31. Chuck Morse, The Nazi Connection to Islamic Terrorism (New York: iUniverse, 2003), p. 46. It should be noted that, according to Klaus Gensicke, Eichmann and Hagen were unable to set up a meeting with Husseini. See Klaus Gensicke, Der Mufti von Jerusalem: Amin el-Husseini und die Nationalsozialialisten (Frankfurt am Main: Verlag Peter Lang, 1988), p. 52. Joseph B. Schechtman, The Mufti and the Fuehrer: The Rise and Fall of Haj Amin el-Husseini (New York: Thomas Yoseloff, 1965), pp. 110, 121, 306. Gensicke, Der Mufti von Jerusalem, p. 165. Schechtman, The Mufti and the Fuehrer, p. 160. Dalin and Rothman, Icon of Evil, p. 50. Efraim Karsh, Palestine Betrayed (New Haven: Yale University Press, 2010), pp. 66-7. Jeffrey Herf, The Jewish Enemy: Nazi Propaganda during World War II and the Holocaust (Cambridge: Harvard University Press, 2006), p. 173. Gensicke, Der Mufti von Jerusalem, pp. 135-8. Quoted in Morse, The Nazi Connection to Islamic Terrorism, p. 60. Dalin and Rothman, Icon of Evil, p. 55. Lukasz Hirszowicz, The Third Reich and the Arab East (London: Routledge and Kegan Paul, 1966), p. 312. Schechtman, The Mufti and the Fuehrer, p. 139. Küntzel, Jihad and Jew Hatred, pp. 34-5. Quoted in Morse, The Nazi Connection to Islamic Terrorism, p. 62. Ziad Abu-Amr, Islamic Fundamentalism in the West Bank and Gaza: Muslim Brotherhood and Islamic Jihad (Bloomington: Indiana University Press, 1994), p. 103. Serge Trifkovic, The Sword of the Prophet, Islam: History, Theology, Impact on the World (Boston: Regina Orthodox Press, 2002), p. 187. Jeffrey Herf, Nazi Propaganda for the Arab World (New Haven: Yale University Press, 2009), p. 242. Al-Quds (Jerusalem), Aug. 2, 2002; Shlomo Ben-Ami, Scars of War, Wounds of Peace: The Israeli-Arab Tragedy (Oxford: Oxford University Press, 2007), p. 214. Küntzel, Jihad and Jew-Hatred, p. 114. Leila S. Kadi, ed., Basic Political Documents of the Armed Palestinian Resistance Movement (Beirut: Palestine Research Centre, Dec. 1969), pp. 137-141, accessed Mar. 14, 2011, on Israel Ministry of Foreign Affairs website, Jerusalem. Efraim Karsh, Arafat's War: The Man and His Battle for Israeli Conquest (New York: Grove Press, 2003), pp. 23, 36; Palestinian National Charter of 1964, Permanent Observer Mission of Palestine to the United Nations, accessed Mar. 14, 2011. Kadi, Basic Political Documents of the Armed Palestinian Resistance Movement. Munich Pact, Sept. 29, 1938, Yale Law School Avalon Project, accessed Mar. 14, 2011. Efraim Karsh, "Arafat's Grand Strategy," Middle East Quarterly, Spring 2004, p. 3. Laurent Murawiec, The Mind of Jihad (Cambridge: Cambridge University Press, 2008), pp. 34, 41. "Question of Palestine," U.N. General Assembly res. 3236, Nov. 22, 1974. "Observer status for the Palestine Liberation Organization," U.N. General Assembly res. 3237, Nov. 22, 1974. Quoted in Barry Rubin, Revolution until Victory? The Politics and History of the PLO (Cambridge: Harvard University Press, 1994), p. 47. Said K. Aburish, Arafat: From Defender to Dictator (London: Bloomsbury, 1999), p. 164. Murawiec, The Mind of Jihad, p. 318. Rubin, Revolution until Victory? p. 66. Karsh, Arafat's War, p. 247. "Fatah's Sixth General Conference Resolutions: Pursuing Peace Options without Relinquishing Resistance or Right to Armed Struggle," The Middle East Research Institute (MEMRI), Aug. 13, 2009. "Hamas Covenant 1988"; Yonah Alexander, Palestinian Religious Terrorism: Hamas and Islamic Jihad (Ardsley, N.Y.: Transnational Publishers, 2002), pp. 47-69. Dalin and Rothman, Icon of Evil, p. 139. "PA TV Broadcasts Call for Killing Jews and Americans," MEMRI, Special Dispatch, no. 138, Oct. 13, 2000. Abu-Amr, Islamic Fundamentalism in the West Bank and Gaza, p. 26. Beverley Milton-Edwards, Islamic Politics in Palestine (London: I.B. Tauris, 1999), p. 188. Sayyid Qutb, Basic Principles of the Islamic Worldview, trans. Rami David (North Haledon, N.J.: Islamic Publications International, 2006), p. 25. Sayyid Qutb, "Our Struggle with the Jews," in Ronald L. Nettler, Past Trials and Present Tribulations: A Muslim Fundamentalist's View of the Jews (Oxford: Pergamon, 1987), p. 81. Sayyid Qutb, Maalim fi al-Tariq (Damascus: Dar Al-Ilm, 2006), p. 111. Quoted in David Aaron, In Their Own Words: Voices of Jihad (Santa Monica: Rand Corporation, 2008), p. 117. Banna, Five Tracts of Hassan al-Banna, pp. 46-7. "Hamas Covenant 1988," art. 13. Alexander, Palestinian Religious Terrorism, p. 57. Hitler, Mein Kampf, p. 103. "Hamas Covenant 1988," art. 18. Hitler, Mein Kampf, p. 493. Related Topics: Antisemitism, Arab-Israel conflict & diplomacy | Summer 2011 MEQ receive the latest by email: subscribe to the free mef mailing list This text may be reposted or forwarded so long as it is presented as an integral whole with complete and accurate information provided about its author, date, place of publication, and original URL.